71 boats competed in the NSW & ACT Laser Championships sailed from Canberra Yacht Cub over the weekend. The event was is two parts Saturday when there was arguably too much breeze and Sunday when there was none. Four races we completed for 4.7′s and Radials and three for Standard rigs on Saturday. With winds stronger than predicted – gusting to 30 knots – there were lots of oops moments and some broken gear. On Sunday with everyone rigged and ready to roll the breeze would not play ball. Never raising above 5 knots and constantly changing in direction it gave RO Andrew McLachlan little choice and racing was called off without, as they say, troubling the scorer. The winner of the Standard rig event was Steve Gunther from Port Melbourne Yacht Club. 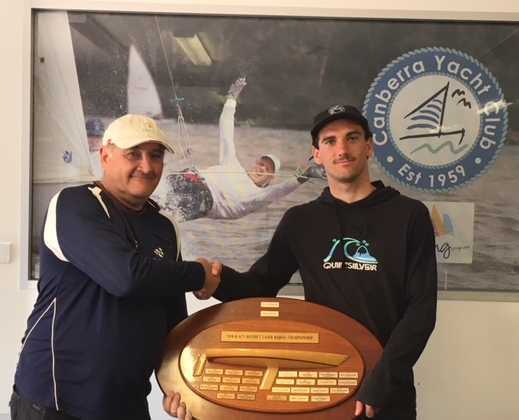 He won from Jeff Loosemore (MHASC/GRSC) and Canberra local Bruce Paine who was the previous winner in 2012 when the event was last held in Canberra. In the Radials Jordan Makin from Belmont 16 ft Skiff Club won from Maddie O’Shea and Zac West both from DBSC and RSYS. It was as close as it can be in the 4.7′s with Brooke Wilson (RSYS/DBSC) and Daniel Costandi (RSYS/GRSC/DBSC) finishing on even points and places and Brooke winning on a count back. Third was Evie Saunders (RSYS/MYC/DBSC). The final results are HERE.